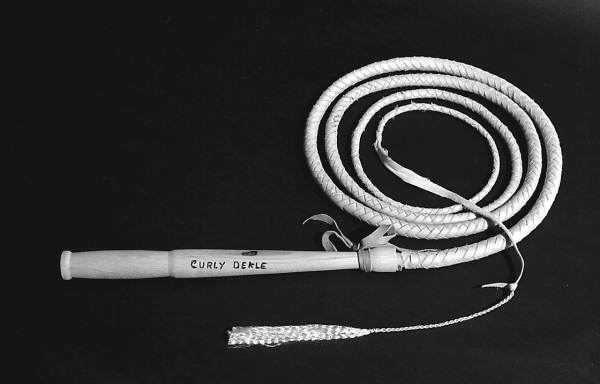 In the picture above is a buckskin cow whip that belonged to well a known Florida whipmaker named Curley Dekle. I found this photo in the Florida State Archives. It is a good example of what cow whips looked like before the advent of nylon. Though I’ve achieved some measure of success as a nylon whipmaker, for a long time I’ve wanted to try my hand at making a Florida Cow Whip from leather. I’m currently in the process of gathering up the materials I will need for my first attempt. The first time I make one it will probably be out of pre-cut lace of some sort just to get a feel for how leather plaits. The I am considering will be similar in size to the nylon cords I use when plaiting whips normally. I’ll post updates as I progress with this project. This entry was posted on Friday, February 6th, 2009 at 10:14 am	and posted in Cow Whips, Leather whips, Projects, Whips. You can follow any responses to this entry through the RSS 2.0 feed.